What is the "Equivalent Wattage"? Is this a "60 watt", a "75 watt", or a "100 watt" bulb? 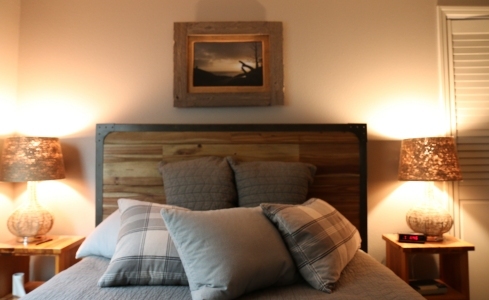 What is the "Color Temperature"? Is this a "warm white", a "cool white", or a "daylight" bulb? In the age of incandescent bulbs, a "100 watt" bulb drew 100 watts of power. The bulb itself said "100 watts". But with the newer lighting the bulbs dissipate much less power. So, for example a "100 watt" CFL bulb will show 23 watts on the bulb, and a "100 watt" LED might show 15 watts on the bulb. And this wattage may vary depending on the manufacturer. So how does one tell how bright the thing will be? Well, here's a little tutorial that will describe how you can determine this. 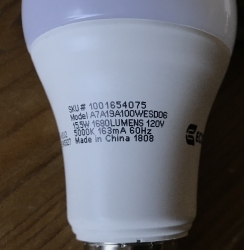 In addition, it'll describe how to determine if it is a "warm white", "cool white", or "daylight" device, since that information is also missing on the bulb itself. 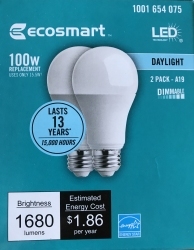 When you buy a CFL or LED light, the box lists the "Equivalent Wattage". This is the wattage the bulb would be if it were an incandescent bulb. So you knew how bright the device would be. Further, the box displayed "warm white", "cool white", or "daylight"
But when you have the bare bulb, you get "light stats" - all the technical info. But since your magic decoder ring's in the shop, you don't have a clue about how bright it will be, nor its characteristic color. No problem. Jimmie's Light Tutorial will explain all this. The brightness is shown as Lumens. The color is shown as Degrees Kelvin. Since the wattage of light bulbs is all over the place, manufacturers now express a light bulb's brightness directly. The unit is "lumens". To compare lumens to the former watts, simply remember three numbers: 800, 1200, and 1600! Note that these numbers are approximate, but it's easier to remember these numbers than it is to remember the variations you will see on different bulbs. For example, "75 watt" equivalent bulbs may range from 1180 to 1210, and "100 watt" equivalents may range from 1500 to 1650. The color (or "Color Temperature") of light bulbs is still referred to as "warm white", "cool white" and "daylight", but will be shown on the bulb itself as "Degrees Kelvin". So you will see, for instance, "2700K" on a warm white light, and "5000K" on a "daylight" light. Note that is not "Temperature" as such. If it were temperature, as in heat, 5000 degrees would clearly be "hotter" than 2700 degrees. It's "Light Temperature", which varies from reddish/orange to white/blue. Greens and purples are left out. Consider heating a piece of metal. It will first flow red, then orange, then white. So 5000 degrees in "Light Temperature" is "cooler" than 2700 degrees in "Light Temperature", even though the metal is "hotter" when it's white. NOTE: Cool white used to be available in the CFL type bulbs that preceded LED bulbs. But apparently the retailers and manufacturers decided that we only need warm white or daylight! So these are the only two choices in mainstream stores. One of the big box home improvement stores has started to carry "cool white" LEDs. I tried these, but they were only slightly cooler than standard warm white; and sure enough, the box label indicated 3000K for Light Temperature. After doing some research, I have identified some bulbs online that are true cool white, 4000K LED bulbs. I have tried them and find they work fine. A link to purchase them is below. Neutral White. These bulbs are 3500K CFL bulbs. Neutral White is not available for LED lights in typical stores. Cool White. Cool White is also not available in typical stores. These are my LUNO 75 W equivalent, 4000K LEDs from Amazon. A link to purchase them is on this page. Daylight. These bulbs are 5000K. When you really want to light stuff up, use "Daylight". 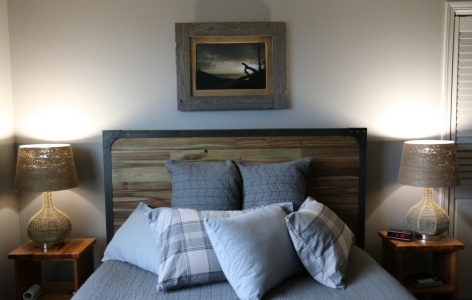 So these are great for kitchens, closets, or garage work areas, but not so good for the bedroom. 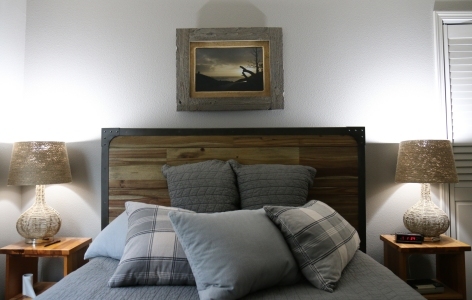 The lights you use can dramatically change the color of paint! 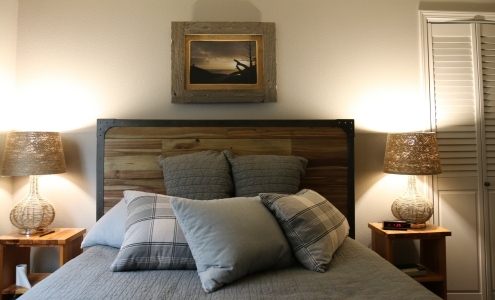 The room shown above actually has grey walls, and the frame around the picture is grey driftwood. So you can make greys look like tans simply by changing the light bulbs to "warm white". As discussed, only "Warm White" or "Daylight" color tint is readily available for LEDs in stores. So here's a link to purchase some 4000K Cool White LEDs from Amazon. This Amazon page allows you to specify 40, 60, 75, or 100 Watt bulbs, in packages of 6. You can also select "Dimmable" or "Non-Dimmable" (less expensive), too. 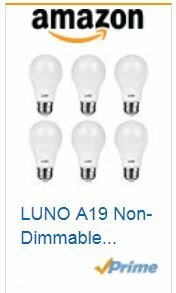 NOTE: Luno refers to these light bulbs as "Neutral White", but most manufacturers consider 3500K to be Neutral White, and 4000K as true "Cool White".